Pharmacy Practice faculty recently recognized by the Indiana Pharmacist Alliance (IPA). I would like to congratulate the following faculty (including some of our adjunct and affiliate faculty) who were recognized by the Indiana Pharmacist Alliance (IPA) during their annual conference. Read more about Pharmacy Practice faculty recently recognized by the Indiana Pharmacist Alliance (IPA). Dr. Carol Ott recently received a grant for $32,000 from the Indiana Area Health Education Centers Network (AHEC). Please join me to congratulate Dr. Carol Ott. Carol recently received a grant for $32,000 from the Indiana Area Health Education Centers Network (AHEC). The AHEC improves health by recruiting, educating and retaining healthcare professionals for underserved communities in Indiana. 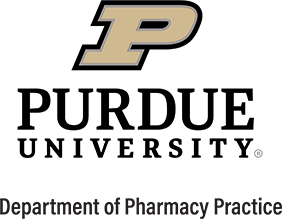 Her grant will support efforts related to the BoilerWorRx project to train healthcare workers on medication assisted treatment of substance use disorders. Read more about Dr. Carol Ott recently received a grant for $32,000 from the Indiana Area Health Education Centers Network (AHEC). Dr. Gail Newton was recently selected to continue her work as an Associate Editor for the 20th edition of the Handbook of Nonprescription Drugs. Please join me to congratulate Dr. Gail Newton. Gail was recently selected to continue her work as an Associate Editor for the 20th edition of the Handbook of Nonprescription Drugs. Congratulations Gail! Read more about Dr. Gail Newton was recently selected to continue her work as an Associate Editor for the 20th edition of the Handbook of Nonprescription Drugs. Please join me to congratulate Dr. Ashley Meredith. Ashley was recently elected to a 1-year term as the public policy liaison for the American College of Clinical Pharmacy (ACCP) Women’s Health Practice and Research Network. Congratulations Ashley! Dr. Lola Adeoye recently was selected to receive the Consortium for Research in Administrative Pharmacy (C.R.A.P.) Award. Please join me to congratulate Dr. Lola Adeoye (Graduate Student and Fellow) along with her mentor Dr. Margie Snyder. Lola recently was selected to receive the Consortium for Research in Administrative Pharmacy (C.R.A.P.) Award. This award recognizes the best research and presentation at the biannual Midwest Social and Administrative Pharmacy Conference, held in Madison, Wisconsin. Congratulations Lola and Margie! Read more about Dr. Lola Adeoye recently was selected to receive the Consortium for Research in Administrative Pharmacy (C.R.A.P.) Award. Dr. Gloria Sachdev invited as a speaker/panelist at the Indianapolis Business Journal Power Breakfast Series on Healthcare and Benefit. Please join me to congratulate Dr. Gloria Sachdev. Gloria is an invited speaker/panelist at the Indianapolis Business Journal Power Breakfast Series on Healthcare and Benefit. She one of six very prominent leaders who are part of this series. https://www.ibj.com/events/259-power-breakfast-series-health-care-benefits The breakfast is scheduled for Friday September 28th. Read more about Dr. Gloria Sachdev invited as a speaker/panelist at the Indianapolis Business Journal Power Breakfast Series on Healthcare and Benefit. Dr. Zach Weber was recently appointed to a two-year term on the Board of Pharmacy Specialties (BPS) Ambulatory Care Pharmacy Specialty Council. Read more about Dr. Zach Weber was recently appointed to a two-year term on the Board of Pharmacy Specialties (BPS) Ambulatory Care Pharmacy Specialty Council. Please join me to congratulate Dr. Jasmine Gonzalvo. Jasmine was recently appointed by the Secretary of Health and Human Services to serve on the National Clinical Care Commission. Dr. Jasmine Gonzalvo recently received the Strategic Initiative Award from the American Association of Diabetes Educators (AADE) during their national meeting. Please join me to congratulate Dr. Jasmine Gonzalvo. Jasmine recently received the Strategic Initiative Award from the American Association of Diabetes Educators (AADE) during their national meeting. Jasmine received this award for her innovative and ongoing approach to integrate diabetes management into clinical care for at-risk adults with serious mental illness (SMI). Congratulations Jasmine! Read more about Dr. Jasmine Gonzalvo recently received the Strategic Initiative Award from the American Association of Diabetes Educators (AADE) during their national meeting. Please join me to congratulate Jane Krause. Jane was recently selected to receive the Indiana Pharmacist Alliance (IPA) "Beyond Dispensing Award" at the IPA Annual Meeting held on Thursday, September 27th. She is receiving this award for her campus project with students to increase awareness of prescription drug abuse and misuse. The students involved in this project (below) are also receiving the award. Congratulations Jane and students!